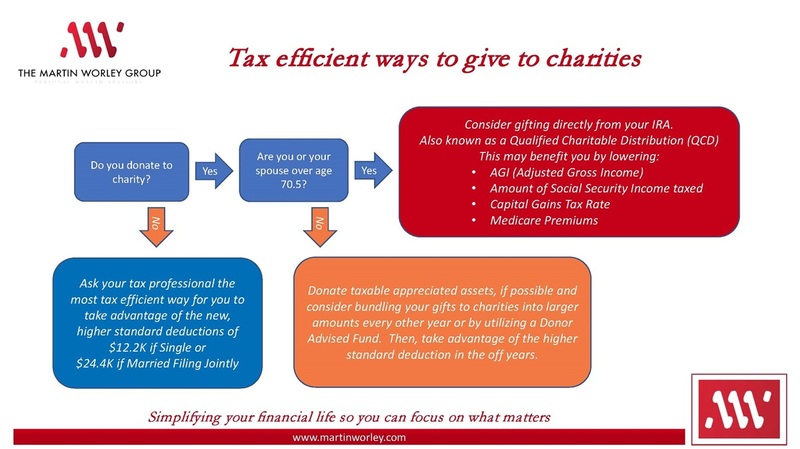 With new tax laws in effect, and many clients no longer itemizing on their tax return, we thought it was important to communicate two of our favorite strategies for tax efficient charitable gifting. Charitable gifting is important to many of our clients, and while taxes shouldn’t be the main consideration when giving, some strategies may help reduce your tax bill more than others. If you are age 70½ or older and have an IRA, you may want to explore the potential of this tax provision. 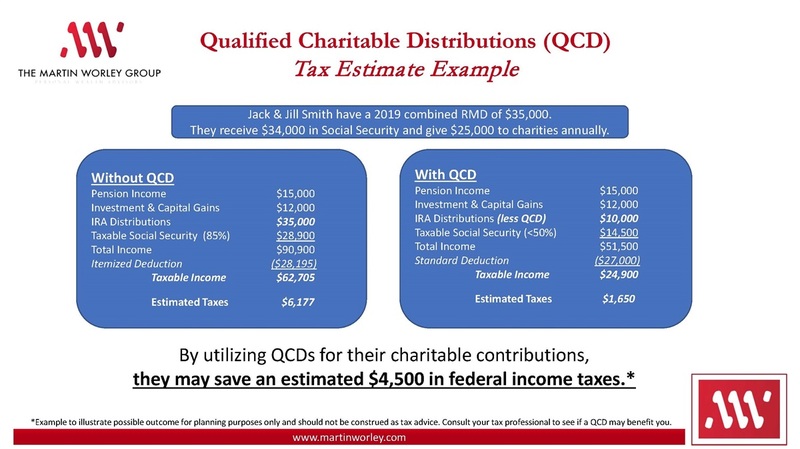 A QCD allows for a direct transfer of up to $100,000 from your IRA to a qualified charity. The gifted amount counts toward your Required Minimum Distribution (RMD). The amount of your gifts, up to $100,000, may be excluded from your gross income in the year in which you make the gift. A QCD may help you lower your Adjusted Gross Income (AGI) because the amount is never included as income to you.A lower AGI may reduce your federal and state tax bill, decrease Medicare premiums, lower taxation of your Social Security benefits, lessen exposure to the 3.8% investment income tax and/or the 0.9% Medicare surtax. Request a checkbook that is linked directly to your IRA at TD Ameritrade. Write a check directly to the charity from your IRA checkbook just like you typically would from your regular checking account. Provide your tax preparer documentation supporting your gifts and advise them to exclude the distributions from your taxable IRA distributions. A DAF is like a charitable savings account. Whether you routinely or occasionally donate to non-profit organizations, a donor-advised fund is worth considering. It may give you an effective way to do good. Contribute appreciated stock or mutual funds to avoid selling them and paying capital gains! You can replace the securities in your account with the cash which you would have otherwise donated directly. Bundling your charitable donations into a single year might allow you to take full advantage of the “free” standard deduction in other years. For example, if you typically donate $15,000 annually to charity, you could donate $30,000 (or more) in one year to your DAF. You could itemize your tax deductions this year and then take the standard deduction in future years. Meanwhile the charity(s) could still receive their regular annual contributions from the DAF. Offset income in unusually high tax years, such as when you sell your business or receive an irregularly large bonus. Donating to a DAF may be especially advantageous in these instances. You contribute assets to it including cash, stock, real estate and more (typically a minimum of $10,000 to establish a fund). You receive the maximum tax deduction that the IRS allows in the year of the contribution to the DAF. You choose the name of your donor-advised fund account, your advisors, and any successors or final charities. Your contribution is placed into its own account where it can be invested and grow tax-free. 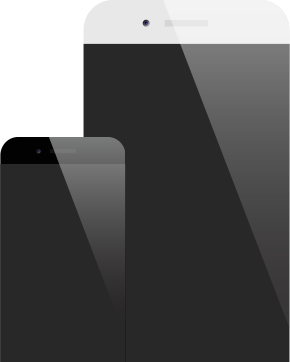 As always, we’re here to answer any questions you might have and would love to help you implement these strategies.